Introduction: Clitoria ternatea flower contains flavonoid such as anthocyanin that gives the blue color to its flower and has antimicrobial activity. Objectives: The aim of this study was to examine the effect of flower juice of Clitoria ternatea against Porphyromonas gingivalis biofilm viability in vitro. Methods: This study was experimental laboratory research using biofilm assay method. P. gingivalis was cultured in BHI broth in 37°C for 24h under anaerobic condition. Fresh flowers of Clitoria ternatea were extracted using mortar and pestle and diluted into 6 different concentrations: 100%, 50%, 25%, 12.5%, 6.25%, and 3.125% with phosphate buffer saline (PBS). Chlorhexidine (0.2%) was used as positive control and biofilm without treatment as negative control. The flower juice was distributed into 96 well-plates that contained biofilm of P. gingivalis and incubated for 1h, 3h, 6h, and 24h in 37°C, anaerobic atmosphere. Biofilm was measured using crystal violet dye with microplate reader (490 nm). Data were statistically analysed using one-way ANOVA test and Post Hoc test with p<0.05 was set as significant different. Result: Result showed that Clitoria ternatea flower juice significantly reduced the Porphyromonas gingivalis biofilm viability in all concentration and all incubation time. The most effective concentration to inhibit Porphyromonas gingivalis biofilm was 100% in 1h incubation time which biofilm was diminished (Optical Density=0.00). One way ANOVA test and Post Hoc test showed a significant biofilm reduction in all concentration and all incubation time after treatment with the flower juice compared to control (p<0.05). Conclusion: Clitoria ternatea flower juice has antibiofilm effect against Porphyromonas gingivalis. This result showed this flower juice may be useful for combating periodontal pathogens. However, further studies using other bacteria are still needed to confirm this result. Hamadi DA, Gunawan PN, Mariati NW. Gambaran pengetahuan orang tua tentang pencegahan karies dan status karies murid SD Kelurahan Mendono Kecamatan Kintom Kabupaten Banggai. Jurnal e-GiGi. 2015;3(1):7-12. Loesche WJ, Grossman NS. Periodontal disease as a specific, albeit chronic, infection: diagnosis and treatment. Clin Microbiol Rev. 2001;14:727–52. Guthmiller JM, Novak KF. Periodontal diseases. ASM Press, 2002. Available at: https://www.ncbi.nlm.nih.gov/books/NBK2496/ (accessed 1 Oct 2018). Otomo-Corgel J, Pucher JJ, Rethman MP, Reynolds MA. State of the science: chronic periodontitis and systemic health. J Evid Based Dent Pract. 2012;12 Suppl 3:20–8. Vieira Colombo AP, Magalhães CB, Hartenbach FARR, Martins do Souto R, Maciel da Silva-Boghossian C. Periodontal-disease-associated biofilm: a reservoir for pathogens of medical importance. Microb Pathog. 2016;94:27–34. Chandki R, Banthia P, Banthia R. Biofilms: a microbial home. J Indian Soc Periodontol. 2011;15: 111–4. Lazar V, Ditu L-M, Curutiu C, Gheorghe I, Holban A, Chifiriuc MP and C. Impact of dental plaque biofilms in periodontal disease: management and future therapy. Periodontitis - Useful Ref. 2017. doi:10.5772/intechopen.69959. Kapoor A, Malhotra R, Grover V, Grover D. Systemic antibiotic therapy in periodontics. Dent Res J. 2012; 9: 505–15. Mombelli A, Samaranayake LP. Topical and systemic antibiotics in the management of periodontal diseases. Int Dent J. 2004;54:3–14. Gowd MJSP, Kumar MM, Shankar AS, Sujatha B, Sreedevi E. Evaluation of three medicinal plants for anti-microbial activity. AYU Int Q J Res Ayurveda. 2012;33(3):423-8. Widyarman AS, Widjaja SB, Idrus E. Strawberry extract’s effects on Enterococcus faecalis and Porphyromonas gingivalis biofilms in vitro. Sci Dent J. 2017;1(1):1–5. Liliany D, Widyarman AS, Erfan E, Sudiono J, Djamil MS. Enzymatic activity of bromelain isolated pineapple (Ananas comosus) hump and its antibacterial effect on Enterococcus faecalis. Sci Dent J 2018;2(2):39–50. Widyarman AS, Suhalim OP, Nandary D, Theodorea CF. Pomegranate juice inhibits periodontal pathogens biofilm in vitro. Sci Dent J. 2018;2(3):101–8. Djunarko I, Manurung DYS, Sagala N. Efek antiinflamasi infusa bunga telang (Clitoria ternatea L.) dan kombinasi dengan infusa daun iler (Coleus atropurpureus L. Benth) dosis 140 mg/kgbb pada udema. Prosiding Rakernas dan Pertemuan Ilmiah Tahunan. Ikatan Apoteker Indonesia. Yogyakarta. 2016. Devi BP, Boominathan R, Mandal SC. Anti-inflammatory, analgesic and antipyretic properties of Clitoria ternatea root. Fitoterapia. 2003;74(4):345–9. Al-Snafi AE. Pharmacological importance of Clitoria ternatea – a review. 2016;6(3):68-83. Voon HC, Bhat R, Rusul G. Flower extracts and their essential oils as potential antimicrobial agents for food uses and pharmaceutical applications. Compr Rev Food Sci Food Saf. 2012; 11:34–55. Widyarman AS, Drestia AM, Bachtiar EW, Bachtiar BM. The anti-inflammatory effects of glycerol-supplemented probiotic Lactobacillus reuteri on infected epithelial cells in vitro. Contemp Clin Dent. 2018;9(2):298-303. Witedja U, Suwartini T, Prahasti AE, Widyarman AS. Comparing the Effectivities of Chitosan Citrate and Chitosan Acetate in Eradicating Enterococcus faecalis Biofilm. Sci Dent J. 2018;2(1):1–7. Naves P, del Prado G, Huelves L, Gracia M, Ruiz V, Blanco J, et al. Measurement of biofilm formation by clinical isolates of Escherichia coli is method-dependent. J Appl Microbiol. 2008;105(2):585–590. Singh N, Patil A, Prabhune AA, Raghav M, Goel G. Diverse profiles of N-acyl-homoserine lactones in biofilm forming strains of Cronobacter sakazakii. Virulence. 2017;8(3):275–281. Iamsaard S, Burawat J, Kanla P, Arun S, Sukhorum W, Sripanidkulchai B, et al. Antioxidant activity and protective effect of Clitoria ternatea flower extract on testicular damage induced by ketoconazole in rats. J Zhejiang Univ Sci B. 2014;15(6):548–555. Carranza FA, Newman MG, Takei HH, Klokkevold PR. Carranza’s clinical periodontology. Saunders Elsevier: St. Louis, Mosby; 2006. Pahune B, Niranjane K, Danao K, Bodhe M, Rokade V. Antimicrobial activity of Clitoria ternatea L.
flower extract and use as a natural indicator in acid base titration. 2013;3(2):48-51. Saptarini NM, Suryasaputra D, Nurmalia H. Application of Butterfly Pea (Clitoria ternatea Linn) extract as an indicator of acid-base titration. J Chem Phar Res. 2015;7(2):275-280. Konczak I, Zhang W. Anthocyanins—more than nature’s colours. J Biomed Biotechnol. 2004;2004(5):239–240. Cisowska A, Wojnicz D, Hendrich AB. Anthocyanins as antimicrobial agents of natural plant origin. Nat Prod Commun. 2011;6(1):149–156. Rabin N, Zheng Y, Opoku-Temeng C, Du Y, Bonsu E, Sintim HO. Agents that inhibit bacterial biofilm formation. Future Med Chem. 2015;7(5):647–671. Kariu T, Nakao R, Ikeda T, Nakashima K, Potempa J, Imamura T. Inhibition of gingipains and Porphyromonas gingivalis growth and biofilm formation by prenyl flavonoids. J Periodontal Res. 2017;52(1):89–96. Kamilla L, Mnsor SM, Ramanathan S, Sasidharan S. Antimicrobial activity of Clitoria ternatea (L.) Extracts. 2009;1:731-738. Tarahovsky YS, Kim YA, Yagolnik EA, Muzafarov EN. Flavonoid–membrane interactions: Involvement of flavonoid–metal complexes in raft signaling. Biochim Biophys Acta BBA – Biomembr. 2014; 1838(5):1235–1246. Zgurskaya HI, Löpez CA, Gnanakaran S. Permeability Barrier of Gram-Negative Cell Envelopes and Approaches To Bypass It. ACS Infect Dis. 2015;1(11):512–522. Cushnie TPT, Lamb AJ. Antimicrobial activity of flavonoids. Int J Antimicrob Agents. 2005;26(5):343–356. WIDYARMAN, Armelia Sari; SUMADI, Stephani; AGUSTIN, Tri Putriany. Antibiofilm Effect of Clitoria ternatea Flower Juice on Porphyromonas gingivalis in vitro. 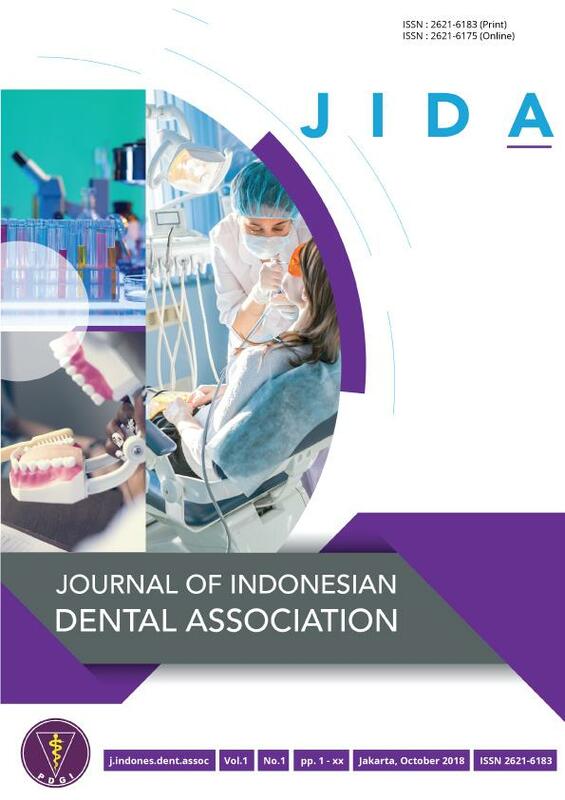 Journal of Indonesian Dental Association, [S.l. ], v. 1, n. 1, oct. 2018. ISSN 2621-6175. Available at: <http://jurnal.pdgi.or.id/index.php/jida/article/view/288>. Date accessed: 24 apr. 2019. doi: https://doi.org/10.32793/jida.v1i1.288.